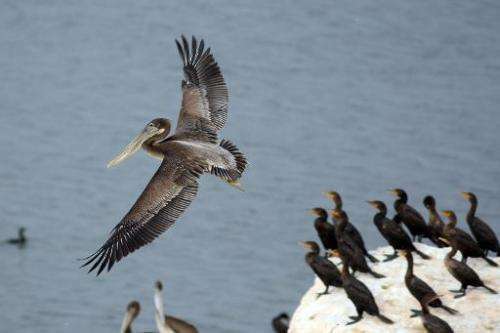 Iconic North American birds like the Bald Eagle and Brown Pelican are among hundreds of mankind's feathered friends facing threats to their survival due to climate change, researchers said Tuesday. More than half of birds in the United States and Canada—a total of 314 species—are losing critical habitat and food sources as the planet warms, said a report by the National Audubon Society. Meanwhile, another annual report called the "State of the Birds 2014, USA," issued by the 23-member US Committee of the North American Bird Conservation Initiative, described losses of as much as 46 percent of birds in deserts and drylands such as Utah, Arizona and New Mexico since the 1960s. Common backyard birds are becoming less common, and those who breed and eat in the coastal wetlands are also struggling. Birds like the eastern meadowlark and the bobolink have declined by some 40 percent since 1968, but losses have leveled off since 1990 with the help of "significant investments in grassland bird conservation," said the State of the Birds report. "Science and conservation, when applied appropriately, can reverse the threats that some species face today, and I think that is an important message," said Smithsonian secretary Wayne Clough at an event in the US capital to discuss the findings. "However, much work lies before us." 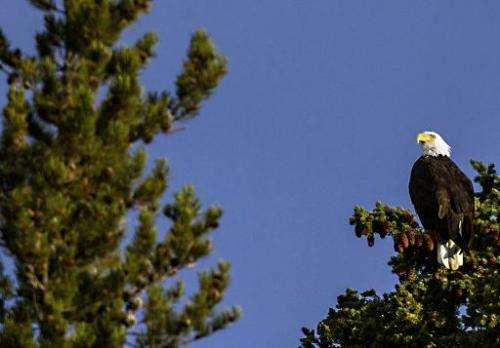 The Audubon report found that the Bald Eagle's summer range could shrink by nearly 75 percent in the next 65 years, while warming temperatures might make nesting and breeding difficult for birds like the Common Loon and the Baltimore Oriole. "Other state birds at risk include Brown Pelican (Louisiana), California Gull (Utah), Hermit Thrush (Vermont), Mountain Bluebird (Idaho and Nevada), Ruffed Grouse (Pennsylvania), Purple Finch (New Hampshire) and Wood Thrush (Washington, DC)," said the findings. "We all will see the effects of changing climate in our own backyards. We just cannot ignore such a sobering wake-up call," said Terry Root, a Nobel Prize-winning Stanford University professor and Audubon board member. The reports' release coincided with the 100th anniversary of the disappearance of the passenger pigeons, which were once among the most abundant creatures on Earth. The last known passenger pigeon, Martha, died at the Cincinnati Zoo in 1914. "We can never forget that we can see something go away forever," said Pete Marra, head of the Smithsonian Migratory Bird Center, recalling other species that have disappeared since, including the Carolina Parakeet, the Eskimo Curlew, Bachman's Warbler and the Po'ouli of Hawaii—home to one-third of all US federally endangered birds. Marra said the biggest causes of bird declines include habitat loss, urban sprawl, lack of food sources and pollution. Dangers to birds will only increase as the global population swells from its current seven billion in the coming decades, said US Fish and Wildlife director Dan Ashe. "When we think about Martha and what happened to her kind in the span of about five decades, think about what will happen in the three or four decades between now and the middle of the century as we add another two-plus billion people to the planet," Ashe said. "It means that there will be less space for the rest of what we call biological diversity." He called for people to recommit themselves to conservation and environmental awareness in order to prevent further extinctions.